Not writing, for a reason | arlette knits. I have been knitting, and not writing. For awhile I wasn’t writing because I was knitting for my mom, who was very sick, and whose circulation got so terrible that even on hot days, she wrapped herself in wool. I have never knitted that hard in my life. I made her wool socks in our favorite color, fire-engine red. I cast on for slippers, after she raved about how the wool socks kept her feet from hurting. I made her a shawl, something more practical than the flashy red lace number I’d made her that she was so proud of. I gave it to her in August. Mom had the shawl for a week. She died at home, in her sleep, with Dad in the next room. I got the striped shawl back awhile later. She’d sewn it closed, since it kept slipping off her shoulders. It has a big, unexplained tear in it that I don’t yet have the heart to repair. I don’t know where the socks are. I also have the red lace shawl that was wrapped around her at the viewing. It’s in a chest next to some incense, gently exuding the smell of funeral home. She might’ve wanted it to go with her; she was very practical and thought things should be used, but the strong sentimental streak that had her digging it out and showing it off at every holiday meant she might’ve wanted to take it with her. I couldn’t decide whether it should be buried with her or not, so I kept it. They gave it back to me at the memorial service, where I wore a red dress the same color as the socks I made her. 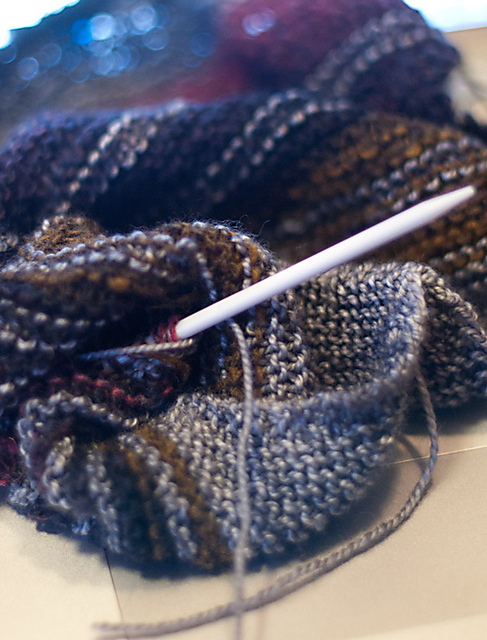 Now it’s months later and I am knitting, but still not really writing, here or anywhere. My heart has been flipped upside-down and shaken out very hard and I am still trying to figure what goes roughly where. I will get there, but not yet.